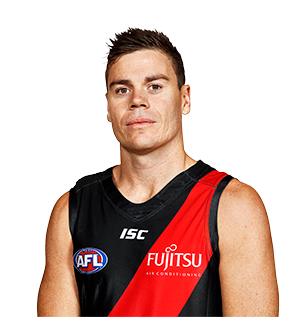 Craig Bird grew up in Nelson Bay (NSW) and played in a premiership with Sydney before joining Essendon at the end of 2015. He is a strong-bodied midfielder who can also push forward. In 2016, Bird played 18 games and finished high up in several key statistical categories for the Bombers including tackles (2nd), clearances (3rd) and contested possessions (4th). Bird’s best form came late in the season with 25 possessions, one goal and nine tackles against Gold Coast and a 22-disposal effort against Carlton in the final three weeks of the year. The 27 year old also picked up 24 possessions in his 150th match against Richmond.